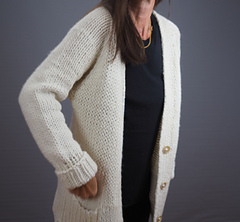 The Kiriko cardi is worked seamlessly in one piece top-down, all over in in stockinette stitch with ribbed frontbands and pockets. The shawl collar starts with a provisional cast on, then stitches are picked up for the back and raglan sleeves. Bust circumference of the finished garment with fronts overlapped and positive ease.